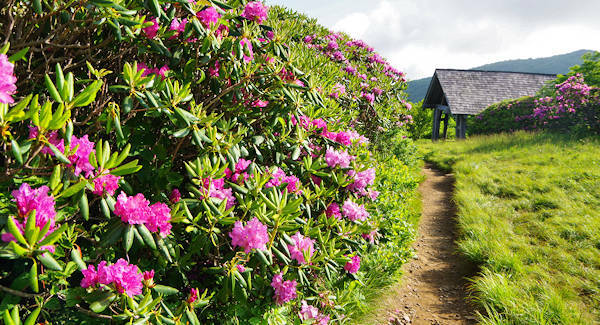 The one-mile Craggy Gardens Trail on the Blue Ridge Parkway takes you across the Craggy Flats, a mile-high rhododendron bald (elevation 5,680 feet). It starts at the south end of parking area at the Craggy Gardens Visitor Center (far left if you are facing the building). The other end of the trail is at the Craggy picnic grounds. 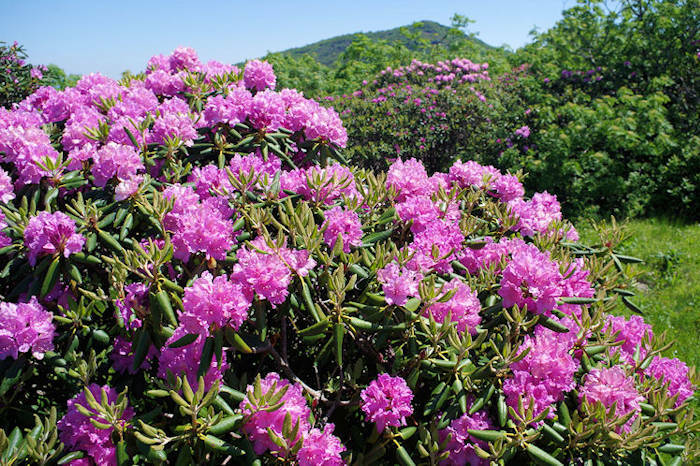 A natural garden of hundreds of Catawba rhododendron cover the heath bald. 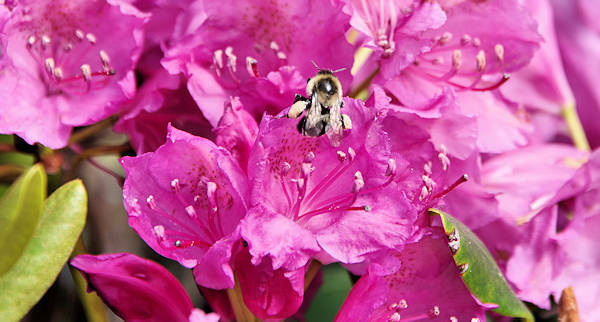 Their purple-pink blossoms peak in early to mid June and attracts visitors from around the world since the Blue Ridge Parkway opened. The yellow spots on the upper petal of each blossom mark the path to nectar for happy bees that will transfer pollen grains to other blooms. Also see a wealth of other wildflowers all summer. Later in the summer, you can pick blackberries and blueberries. It's also a great birding spot. To reach the gardens, the hike is a little easier if you start at the Visitor Center. You'll begin your gradual uphill walk through a lush forest that sees frequent summer rain, heavy winter snows and very high winds during stormy periods. Walk though rhododendron and evergreen spruce and fir. In about a third of a mile, you'll reach the historic picnic shelter. 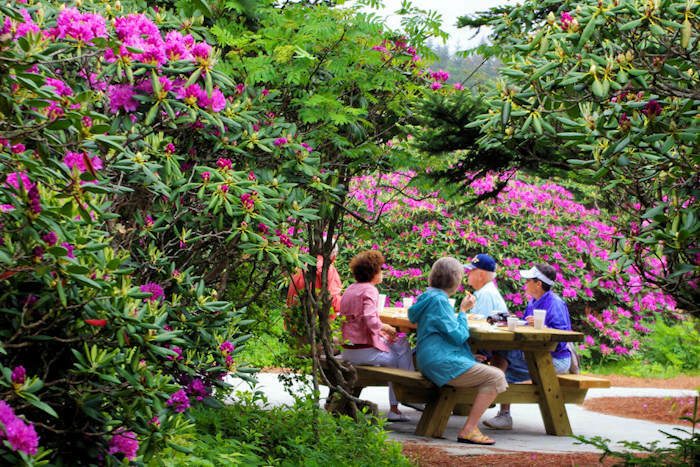 To the left, a side trail will take you through the rhododendron to an overlook, with various other side trails. If you walk through the shelter, the trail begins again on the other side, taking you downhill to the picnic area. If you begin at the picnic area, it's an half mile uphill trek to the shelter and bald area. 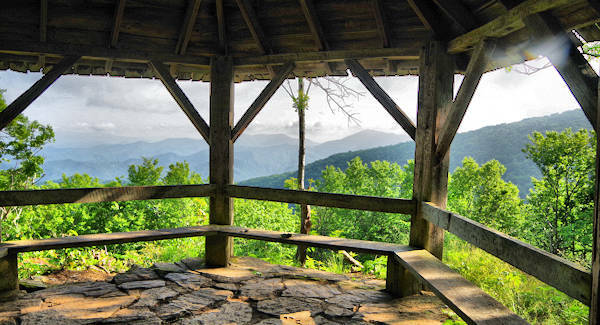 On the way up, take a short detour to the historic gazebo with recently cleared views. A very romantic spot! Read more about Craggy Gardens and the hike to Craggy Pinnacle. Also see our Blue Ridge Parkway Guide. 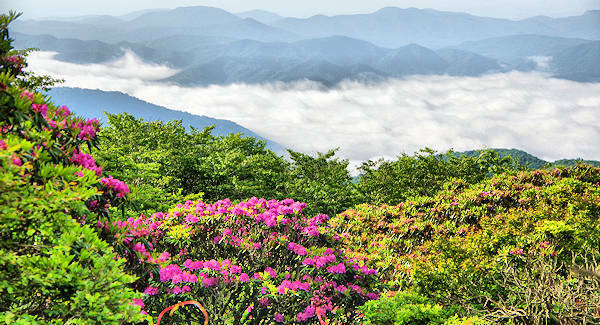 Directions: Craggy Gardens is about 18 miles north of Asheville on the Blue Ridge Parkway at Milepost 364.4. Note: This section of the Parkway is often closed during winter months due to snow and ice. I Love Craggy Fundraiser: Thank you for helping us raise funds for much needed trail repairs. Read more!